Industrial maintenance platforms help keep your technicians safe from the unexpected, even if the unexpected happens to be a fall. All of our maintenance platforms are custom-engineered to provide your technicians with a premier level of accessibility and protection. Our Engineers work hand-in-hand with clients to meet the unique needs of every situation, and we can build a custom platform for any application. We’ll even design your custom maintenance platforms on our dollar, so why not give us a try? 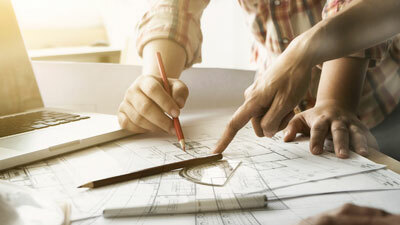 Engineering takes the design requirements and build specifications and begins the conceptual drawing process. Concepts are reviewed by clients and staff and any possible revisions or changes are completed prior to approval. Once the concept is approved, the engineer reviews all OSHA requirements needed for the design. As the design progresses, Design for Manufacturing techniques are employed. The complete 3D model is approved by management. 2D drawings are drawn along with appropriate BOM and any specific manufacturing instructions are described. During manufacturing, revisions are made on the fly for quick turnarounds of products. We have custom solutions for safe access platforms, fall protection platforms, maintenance support equipment, and more. Our engineers can help you create a unique solution for your unique needs. Feel free to contact us today to learn more about our engineering techniques and our collaborative design process. We look forward to hearing from you!